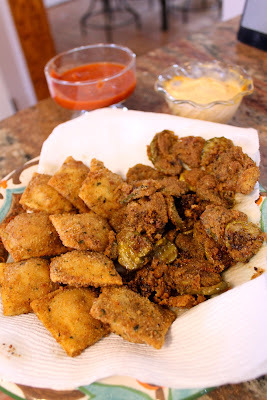 Bossy Italian Wife : Quick Fix: Deep Fried Pickles & Ravioli! The words "deep" and "fried" send some people running for the hills....not me! I love some deep fried foods. They aren't something I enjoy all the time, but they are something I enjoy. 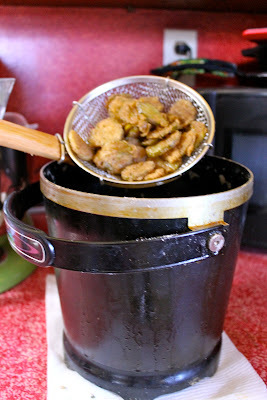 This New Year's Eve, I made up some fried pickles in my Mama's Fry Daddy (hehe...Mama's Fry Daddy, has a ring to it, doesn't it?) and when the night was over, she said, "You borrow it." I was only too happy to take her up on it. I had been saving some ravioli for such an ocassion as my mom lending me her Fry Daddy! Remember the prosciutto and fig ravioli?? Yep, I still a couple in the freezer just begging to be deep fried. So one afternoon, fry them I did!!! Now I understand that pickles and ravioli may not seem the most likely foods to pair, but when you are deep frying, there are no rules. 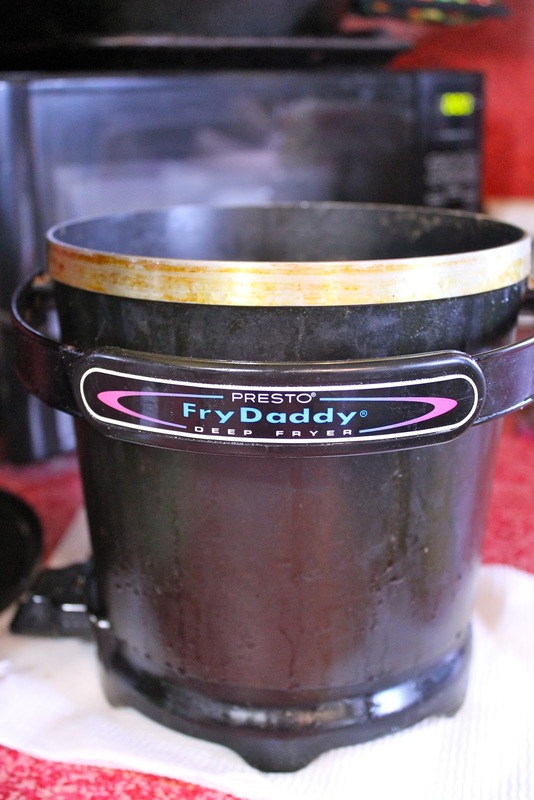 I feel deep frying is like meditation... it just clears your mind. Maybe it's the smell of the grease or maybe it's the sizzle. I don't know precisely, but I love it. Love. It. So get yer ravioli and pickles ready! Let's fry together, shall we? Observe: frozen raviolis. 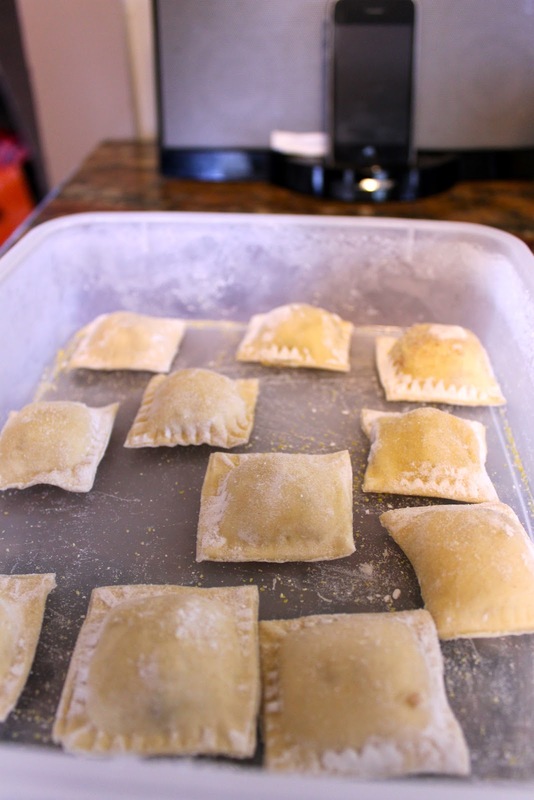 When it comes to homemade raviolis, freezing is a must! (at least in my book!) 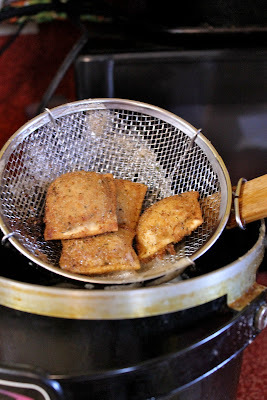 Just before you are ready to fry, pull them out of the freezer and let them thaw a tad. Getcha pickles ready! I save my juice for bloodies. It's how I roll. Plug it in, let it heat up! One egg and some milk. Best batter coater. Mix it up with a fork real goooood. 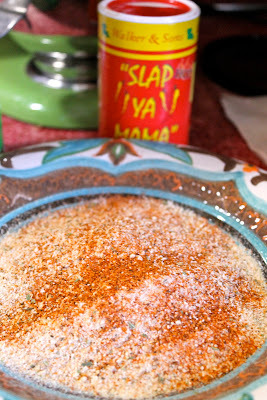 On another plate, add some bread crumbs and, if you like, some heat. My Mama gave me this "Slap ya Mama" spice. It's kickin'! I started with my raviolis. And then in the breadcrumbs. Note: my hand model, Jenn. She's doing a lovely job, isn't she?! Then drop it in your pre-heated oil. I let them fry about 4 minutes and they were perfect!!! We are doing virtually the same thing with the pickles. First in the egg/milk mixture and then the breadcrumbs. Get a good coating on there. Then fry them for about 5 minutes. I know it seems silly to fry the pickles more than the ravioli, but that was how it worked out. Go figure. Look at them purdy pickles. They make me happy! Put 'em on a plate and serve with your choice of dipping sauces. I used some marinara sauce and some homemade chipotle mayo--YUM! Time: 15 minutes | Makes: Depends on what you got | Difficulty: Deep-fried Easy! A word on your ravioli. If you have frozen, then take them out and set them aside. Let them "thaw" about five minutes. If you have fresh ones, that is great too. Prepare your batter: on a plat beat one egg and about 1/4 cup of milk until blended. On a separate plate, pour a nice sized pile of bread crumbs. Add some spicy spice if you like (to taste), optional. I like a little heat on mine, but you might not! Prepare your pickles by draining them from the juice. I save my juice, but whatever works for you. Lay out a plate with paper towels so that when your stuff is done frying you have a nice place to put it. Start with your raviolis: dip them one at a time first in the egg and then in the breadcrumbs to coat. Place it carefully into the Fry Daddy (being gentle so you don't get a face full of hot oil.) I fried about 5 at a time together. Allow it to fry 3-4 minutes. 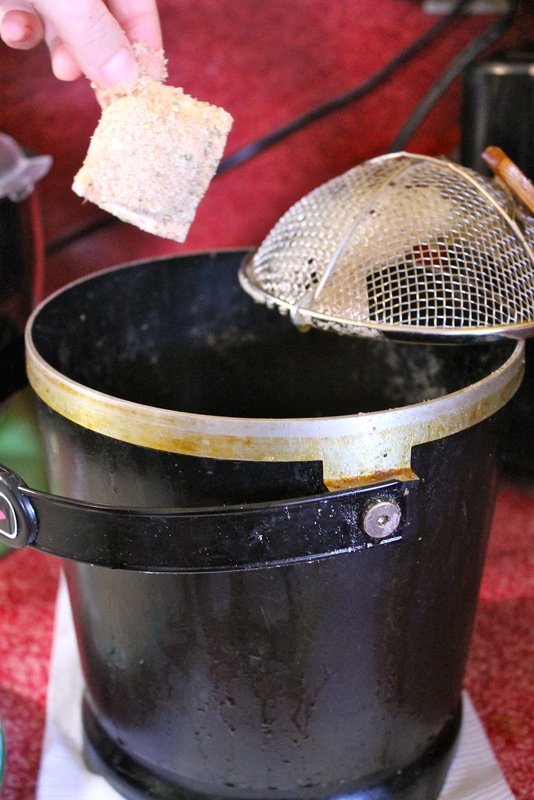 Remove from the fryer and place on your plate. 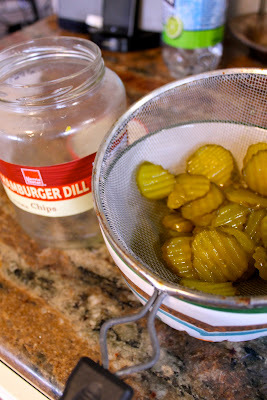 For the pickles: You can use as many as you like, and I do them in batches about a fistful at a time. Roll them first in the egg and then in the breadcrumbs. 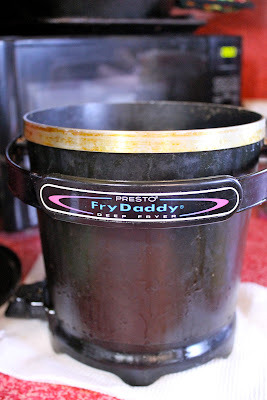 place them in the fryer and let them go about 5 minutes. Remove to the plate with the paper towels when finished. To serve, I leave them right on that plate (no sense in transferring them when they will be disappearing in seconds flat anyway!) and I serve them with some dipping sauces. Marinara for the ravioli and chipotle mayo for the pickles!